I’ve heard a lot of disrespectful conversations lately. From the evening news to the high school parking lot, there is no shortage of people who do not like the way others are doing their jobs and who are very vocal about it. Almost 30 years ago I was working with a mentor who called me up and fired me. She didn’t think I was taking the mentorship seriously enough. I did not put the phone down before calling someone else to mentor me. I am forever grateful to Sharon Andrews for not only answering her phone when I called but for agreeing to take me on. Sharon was a very active woman and I knew I could learn a lot from her. The lesson that stands out the most vivid for me happened one day while we were painting an office. Sharon was the head of the women volunteers working on our new church building. We had gotten to the point of painting offices. Sharon and I had just finished putting the first coat of paint on the room that would be the staff break room when a gentleman I had never seen before came in and said “You missed a spot.” Sharon handed him her paint roller and said “Go for it”. She winked at me. I put down my roller and we went to lunch. When we had come back the man had found so many spots that he had completely painted the second coat of paint on the whole room! We had every intention of painting a second coat but because he interjected himself into the situation before we were done several things happened. 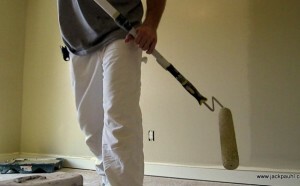 He unexpectedly found a paint roller in his hand and the authority to fix the situation himself. We were relieved of our task. The room got painted. Sharon taught me a great deal by handing off that paint roller. She knew the goal was to get it painted. She was not locked into painting it herself and was able to delegate it to someone who saw the job needed work. Then she was able to walk away and let him do it. This week I walked away from a situation. I put my roller down and walked out. I don’t expect this particular room to look any different for my absence. There were plenty of people arguing about how to finish painting it and while leadership was noticeably lacking opinions were not. I have no doubt the room will be finished. I just don’t need to be there or be part of the process. They are in the middle. I’m sure it will all be fine when they are done. Thanks, Sharon, for teaching me how to let go. We need to get together for lunch soon.